American Idol Kris Allen finding out he's going to be rich. According to this Access Hollywood article (here), a top FOX source told them that the results were not even close. Kris Allen won the American Idol finale by a large margin. Imagine that. The previous week, only 1 million votes separated the Adam and Kris. I guess the majority of Danny Gokey’s fans voted for Kris Allen. And why wouldn’t they? Kris is married and he served as a worship leader at his church. Sound familiar? It should because that is pretty much Danny’s bio as well. And once again, Simon Cowell had it all wrong. Last year he proclaimed David Archuleta the winner, but David Cook won. 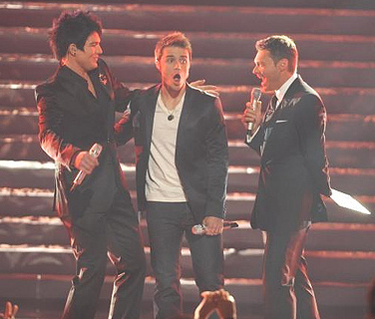 This year he did the same, proclaiming Adam Lambert the winner, but Kris Allen won. Why do I even know so much about this stuff? I only watched a few episodes at the beginning of the season. I like that part of the season because it’s like stopping to watch cars about to wreck. But it’s really not cars. It’s people who are failing at life. Well, American Idol, you did it again. Whatever it is that you do. See you next year. Good luck to Kris and Adam.